Managing an HPC server can be a tricky job, and managing multiple servers even more complex. Adding GPUs adds even more power yet new levels of granularity. 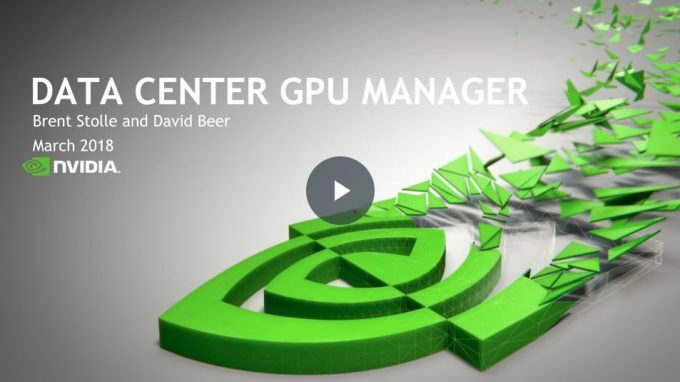 Luckily, there’s a powerful, and effective tool available for managing multiple servers or a cluster of GPUs: NVIDIA Datacenter GPU Manager. Build a group of GPUs once you know which slots your GPUs are installed in and on which PCI-E trees and NUMA nodes they are on. This is great for binding jobs, linking available capabilities. Run basic diagnostics and sample jobs that are built into the DCGM package. DCGM provide a mechanism to set policies to a group of GPUs. Run a check before each job, after a job, or daily/hourly to ensure a cluster is performing optimally. This allows you to preemptively stop a run if diagnostics fail or move GPUs/nodes out of the scheduling queue for the next job. Jobs often need a certain class of node (ex: with >4 GPUs or with IB & GPUs on the same PCI-E tree). DCGM can be used to report on the capabilities of a node and help identify appropriate resources. Some codes request specific CUDA or NVIDIA driver versions. DCGM can be used to probe the CUDA version/NVIDIA GPU driver version on a compute node. Users can then script the deployment of alternate versions or the launch containerized apps to support non-standard versions. Stress tests like Microway GPU Checker can tease out failing GPUs, and reading data via DCGM during or after can identify bad nodes to be sidelined. Programmatically set GPU Boost or max TDP levels for an application or run. This allow you to eke out extra performance. Alternatively, set your GPUs to stay within a certain power band to reduce electricity costs when rates are high or lower total cluster consumption when there is insufficient generation capacity. Script the pull of error logs and take action with that data. DCGM can be used in many ways. We won’t explore them all here, but it’s important to understand the ease of use of these capabilities. The syntax is very standard and includes dcgmi, the command, and the group of GPUs (you must set a group first). In the diagnostic, you include the level of diagnostics requested (-r 1, or lowest level here). This entry was posted in Administration, Benchmarking, Hardware, Software. Bookmark the permalink.